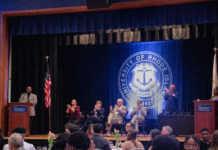 Nestled against Narragansett Bay is the University of Rhode Island Graduate School of Oceanography, home of what some people consider the most interesting research in the world. This campus is home to many facilities and projects that most of the general public is not even aware of. These facilities include the Rhode Island Nuclear Science Center (RINSC), and the Inner Space Center (ISC). This facility is used as a source of radiation for advancing the sciences, mainly physics, biology, atmospheric chemistry and engineering. Unlike large reactors that are used to generate power, the RINSC only produces two mega-watts of power. Located in a large square concrete building, the RINSC is an open pool, light-water reactor. What this means is that the top of the reactor vessel is open and light-water is used as a coolant. Standing at the top where the control room is located, you can see the blue glow coming from the fuel cells. This blue glow, or chernenkov radiation is caused by particles in the Uranium-238 core breaking down and shooting out into the water in all directions, faster than the speed of light. In the summer of 2009 the ISC opened its doors and began streaming its research dives live to the Internet. The ISC was founded by Dr. Robert Ballard, known by many for discovering the underwater remains of the iconic ship the Titanic, to create a high speed exploration platform to be used by scientist interested in furthering our knowledge of the deep ocean. The ISC promotes ocean exploration by using remotely operated vehicles, ROV’s, which stream live data and footage to the ship via an umbilical. The video, audio and data is compressed and bounced off a satellite back to the ISC, which is used as the download center. The high resolution footage and data is stored on the ship and is archived at the ISC when the ships return to port. Dr. Steven Carey, a professor of oceanography, described an experience he had during a dive, where they stumbled upon a World War II era fighter plane. “All of a sudden, people watching this could identify the plane, the country of its origin, time period, in a matter of, I think it was about a minute where all that information started to come in.” Â Carey said. According to Dr. Carey, before the ISC it would have taken months to identify the plane, the scientist would have to go back to the site with much slower and more traditional methods of research. “It was very impressive, it really showed me the power of this telepresence technology,” said Carey. The ISC has two research vessels in operation approximately six months out of the year. The Â NOAA Okeanos Explorer and the Nautilus. According to Coleman this upcoming research season will see the addition of the RV Endeavor to the fleet, which is currently being fitted with the appropriate the equipment to support telepresence.